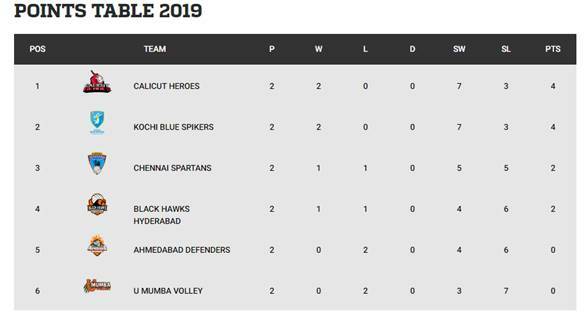 Day 6 of the RuPay Pro Volleyball League saw Chennai Spartans register their first win of the season defeating Black Hawks Hyderabad (15-12, 15-12, 15-11, 15-10, 13-15) here on Thursday. Naveen Raja Jacob was the star of the show for Chennai as he amassed 16 points (12 spikes and 4 serve points). For Hyderabad it was yet again skipper Carson Clark who led from the front with 12 points (11 spikes and 1 block). At 8-2, Black Hawks Hyderabad looked set to take home the first set. 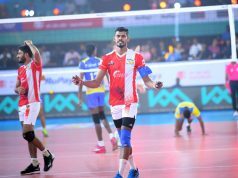 Post the first Technical Time Out (TTO), Chennai found their feet as they crawled up to 10-10 thanks to handful of errors from Black Hawks and conversion of Super Point with a brilliant serve by skipper Shelton Moses. At 11-10 Black Hawks called for a Super Point but a fault on the serve by Prashant P handed a one-point lead to Chennai. From there, Chennai settled the matter in their favour at 15-12. Riding on the high of winning the first set, Chennai raced into a 5-1 lead as Jacob, G S Akhin, and Rudy Verhoeff spiked their way through the Hyderabad defence. 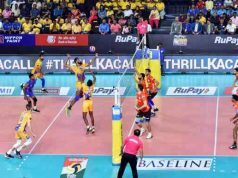 At TTO, Chennai was leading 8-4 and immediately called for a Super Point but Ashwal Rai’s spike helped Hyderabad break Chennai’s serve and win the Super Point. Hyderabad called for a Super Point at 8-10 and it was Alex Bader who intercepted Chennai’s weak receiving with an inch perfect spike to level the scores at 10-10. 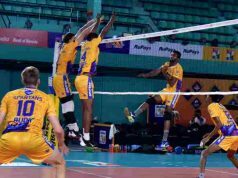 But exactly as it happened in first set, from 10-10 Chennai got five points compared to Hyderabad’s two to win the second set 15-12. For Hyderabad, third set was crucial to stay alive. But Jacob took the matters in his hands from there scoring six points by himself. At 10-9, seeing the opportunity, Hyderabad called for a Super Point and lost it to a spike from Jacob. He followed it up with a Super Serve and followed and another serve point to kill all the momentum Hyderabad tried to gather. Expectedly, Chennai won the third set 15-11 to take an unassailable 3-0 lead in the match. In no time, Chennai went up 8-4 in the penultimate set. Hyderabad broke Chennai on their Super Point to reduce the gap to 6-8. Soon after, Hyderabad called for their Super Point at 7-9 and a bad serve into the net by Muthusamy Appavu pulled them down further. Chennai didn’t waste much time before closing the set 15-10. At 4-0, they sensed that they could register the first whitewash of the league. At 8-5, it seemed a genuine possibility but Hyderabad was somehow hanging in the set. They called for a Super Point at 9-8 and it was Sorokins who won it for Chennai with a spike. 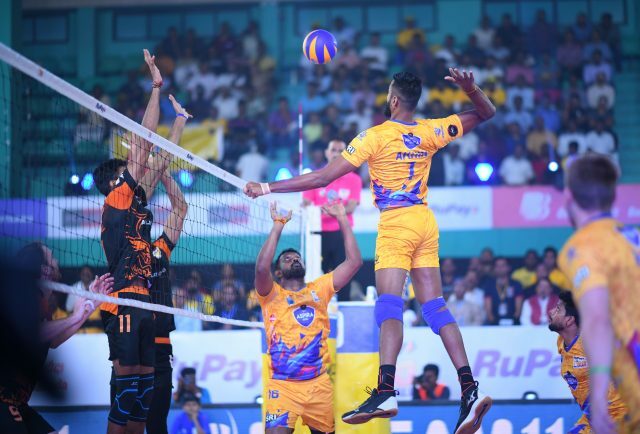 Chennai immediately called for the Super Point at 10-9 and gave away the point to Hyderabad as the score stood 11-10 in favour of Hyderabad. Hyderabad didn’t allow this lead to slip and ended the set in their favour at 15-13, winning the only set out of the five. Kochi Blue Spikers will take on Black Hawks Hyderabad on February 8th 2019. It will be broadcast Live and Exclusive on SONY SIX and SONY TEN 3 and will be streamed live on SONY LIV from 6:50 PM IST.